Growing construction market, expansion of metros & airports, upcoming of new hotels & malls and growing mining are the few factors that have resulted in the growth of Earthmoving Equipment market in Saudi Arabia. Further, growth in government expenditure on infrastructure development has impacted for the wide utilization of earthmoving equipment in the construction industry across Saudi Arabia. According to 6Wresearch, Saudi Arabia's Earthmoving Equipment market is projected to grow at a CAGR of 9.2% during 2015-21. In 2014, loaders accounted for major share of the market pie followed by construction tractors. During 2015-21, loaders segment is expected to maintain its market dominance and would further contribute to the growth of the market. Amongst all verticals, construction vertical accounted for around 60% of the market share and is expected to lead in the forecast period due growing investments and construction activities in the country. The report thoroughly covers the market by Earthmoving Equipment types, verticals, and regions. The report provides the unbiased and detailed analysis of the on-going trends, opportunities/high growth areas, market drivers which would help the stakeholders to device and align their market strategies according to the current and future market dynamics. •	Historical data of Global Earthmoving Equipment Market for the Period 2010-2014. •	Market Size & Forecast of Global Earthmoving Equipment Market until 2021. 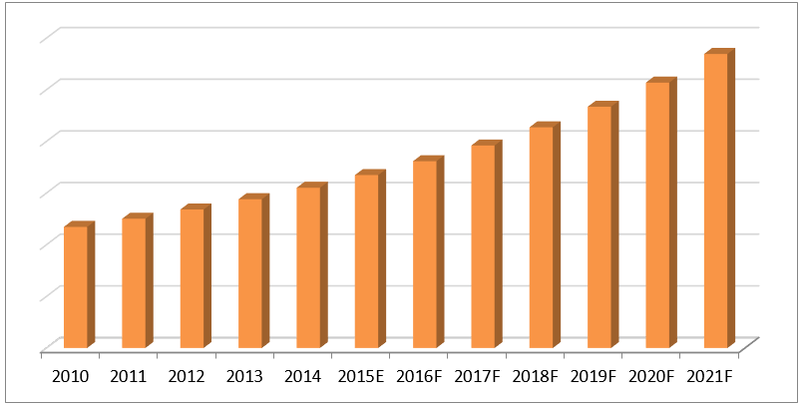 •	Market Size & Forecast of Saudi Arabia Earthmoving Equipment Revenue & Volume Market until 2021. •	Market Size & Forecast of Saudi Arabia Excavators Market Revenue & Volume until 2021. •	Historical data of Saudi Arabia Loaders Market Revenue & Volume for the Period 2010-2014. •	Market Size & Forecast of Saudi Arabia Loaders Market Revenue & Volume until 2021. •	Historical data of Saudi Arabia Construction Tractors Market Revenue & Volume for the Period 2010-2014. •	Market Size & Forecast of Saudi Arabia Construction Tractors Market Revenue & Volume until 2021. •	Market Size & Forecast of Saudi Arabia Earthmoving Equipment Application Market Revenue & Volume until 2021. •	Market Size & Forecast of Saudi Arabia Earthmoving Equipment Regional Market Revenue & Volume until 2021. •	Players Market Share and Competitive Landscape. Saudi Arabia is one of the key growing Earthmoving Equipment Market. Growing construction market, mining industry and growing spending on construction of public infrastructure in the country are the key factors that are spurring the market for Earthmoving Equipment in Saudi Arabia. In the Earthmoving Equipment market, loaders accounts for the major share followed by the Construction Tractors and Excavators. In the forecast period, share of construction tractors is expected marginally to excavators due to availability of attachment with the excavators and growing construction in the housing sector. The key players in the market include: Caterpillar Inc., AB Volvo, BEML Limited, Komatsu Middle East FZE, Hitachi Construction Machinery Ltd, Doosan Infracore Co. Ltd, Mitsubishi Corporation, JCB Bamford Excavators Limited, Hyundai Heavy Industries, and Saudi Liebherr Company Ltd.
“Saudi Arabia Earthmoving Equipment Market (2015-2021)” report estimates and forecast overall Saudi Arabia Earthmoving Equipment market by revenue, by Earthmoving Equipment type such as excavators, loaders and construction tractors, by application, and by regions such as Southern region, eastern region, western region and central region. The report also gives the insights on competitive landscape, market share by companies, market trends, company profiles, market drivers and restraints.